DALLAS, TX —(October 29, 2014)—Mohr Partners, Inc. recently sponsored and hosted a golf tournament with 100% of the proceeds benefiting Jonathan’s Place. The event raised more than $30,000 to help the abused and neglected children of North Texas. 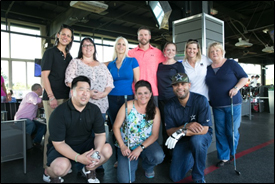 The Mohr Partners Golf Classic was held at the Topgolf Dallas location on October 9. The Las Vegas-themed event featured a live DJ, competitive games, food, prizes and a silent auction. Teams of six players competed in the tournament while enjoying complimentary beer and wine. Each dollar given to the Mohr Partners Golf Classic went directly to Jonathan’s Place, the first licensed foster group home in Texas for drug-addicted babies and small children. Jonathan’s Place provides emergency residential care services to abused, abandoned and neglected children, foster care and adoption. Their facility was created and is operated by the Kid Net Foundation, a non-profit organization founded in 1991 by Dallas resident Lisa Matthews and Phil Matteis to provide specialized services and housing to at-risk children in Dallas County and throughout the state. Several times a year Mohr associates visit the cottages for fun events, donating supplies necessary for maintaining the homes. Throughout the year, Mohr associates sponsor fundraisers to raise money for which Mohr Partners, as a company, matches all donations. If you would like to contribute to the work being done at Jonathan’s Place, you can make a direct donation by visiting the organization’s website at http://www.jpkids.org/get-involved/make-a-donation.